Ocho Rios (Spanish for “eight rivers”) is a former fishing village and was the first town in Jamaica to be specifically developed as a major tourist destination. 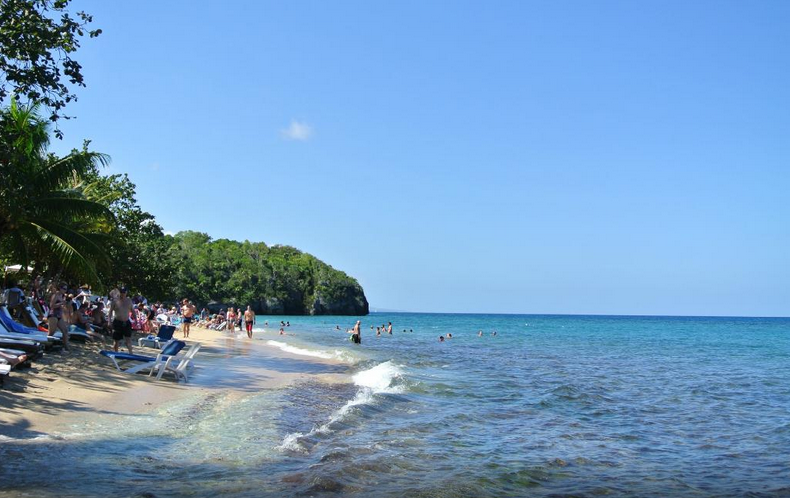 Ocho Rios has a vast number of duty-free shops, restaurants, night clubs, and craft markets, which allows tourists to experience the country without straying too far from the comforts and conveniences of home. 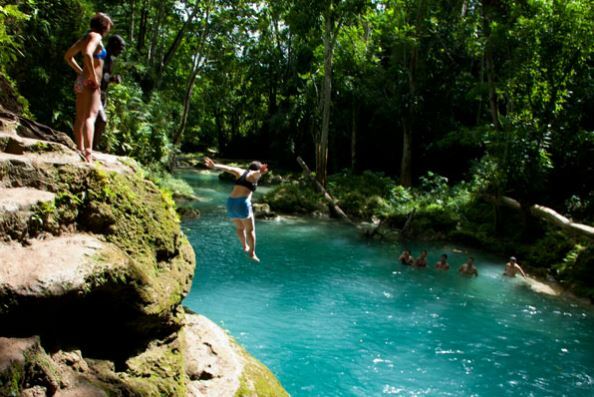 Moreover, Ocho Rios has some of the most stunningly beautiful sightseeing and adventure tour spots in Jamaica, such as Dunn’s River Falls, the White River, and the Blue Hole Secret Falls. Read on to learn more about our top 5 places to visit in Ocho Rios, Jamaica. 1. The Blue Hole Secret Falls is rated #1 on TripAdvisor for activities to do in Ocho Rios, Jamaica for a reason, as it is a stunningly beautiful, unique and refreshing, off the beaten path Jamaica adventure tour where you can swim, jump, and swing like Tarzan from ropes into the blue crystalline water at the bottom of the falls. In addition, there are also tunnels underneath the falls if you don’t want to jump or swing off of them. And your Jamaica Tourist Board certified tourist guide will make sure that you are completely safe throughout the tour; as well as take your photo too, if you wish! 2. 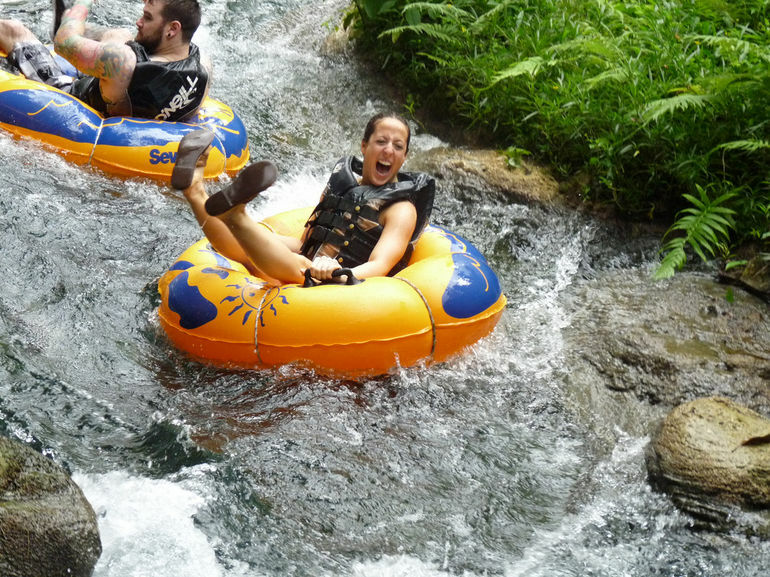 The White River is ironically rated #2 on TripAdvisor for top attractions in Ocho Rios, Jamaica, and is another great outdoor Jamaican adventure tour that you won’t want to miss out on while you are visiting Jamaica. At the White River you can go on a guided tubing or bamboo rafting tour and see a variety of unique local animal species, while having fun with family and friends. The Bamboo Blu Restaurant is rated #1 for restaurants in Ocho Rios, Jamaica, on TripAdvisor.com for several reasons, besides the incredibly breath-taking Caribbean beach location. Firstly the food is very good and affordable; as the plates range from just $4-$40 U.S. Secondly the customer service is second to none. 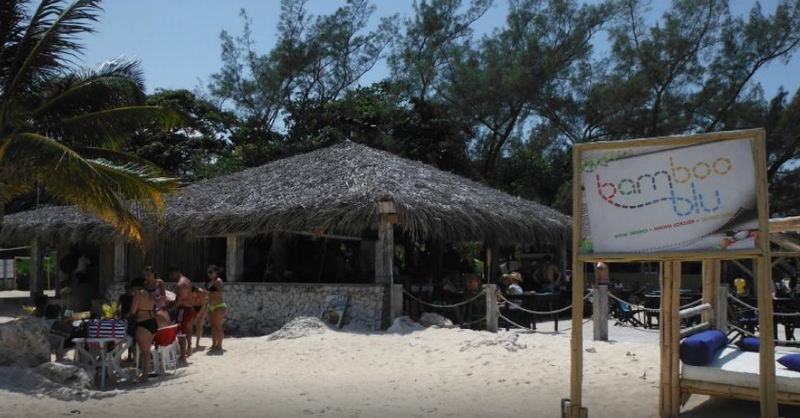 And who doesn’t love a beach where you can both swim and dine at one of the finest and affordable restaurants in Jamaica. 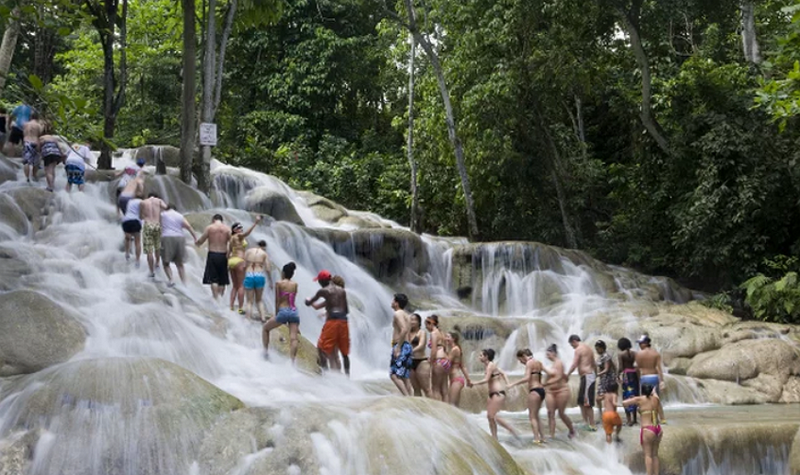 Dunn’s River Falls is another extremely popular tourist destination for people visiting Jamaica. However, due to the amount of vast amount of people that visit the falls from the cruiseship port in Ocho Rios, you will want to go on a day when not a lot of cruise ships are docked at the port, so that you can miss out on the huge crowds at Dunn’s River Falls. Nonetheless, Dunn's River Falls is one Jamaica adventure tour you will not want to miss while you are visiting the island. The Rainforest Bobsled Jamaica at Mystic Mountain adventure park is located right next to Dunn’s River Falls in Ocho Rios and includes 100 acres of land, stretching from the entrance near Dunn’s River Falls to the pinnacle of the 700-foot tall Mystic Mountain, which can be accessed by the Sky Lift Explorer. 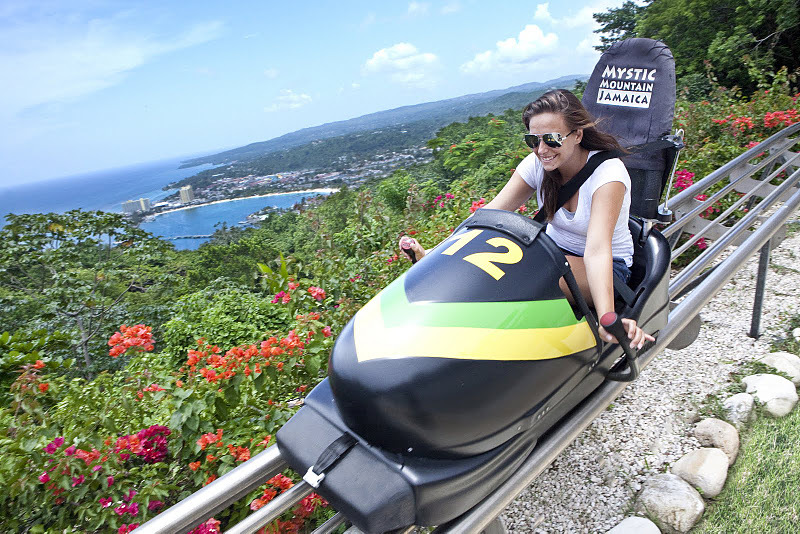 Once you’re at the top of Mystic Mountain you can go on the Jamaica Bobsled ride or ziplines. If you are interested in visiting Ocho Rios or inquiring more about any of these great Ocho Rios sightseeing and adventure tours, you can check out our Ocho Rios tours and private Montego Bay airport transfer services pages on our website or contact us at 1 (876) 287-2180 in Jamaica or 1 (860) 499-0256 in the U.S.